People say you can't buy everything at Trader Joe's, but for recipes without fresh produce, you can! Trader Joe's actually has a decent selection of cheap, unique cheeses like this cheddar with caramelized onions mixed throughout. (Another one we're into is Unexpected Cheddar, a sharp combination of parmesan and aged cheddar.) What's bad about cheddar in grilled cheese is that it isn't as stringy and oozy as a Kraft single. What's good about cheddar in grilled cheese is everything else. Hot pepper jelly is a weird ingredient. We don't use it for much, but a jar of it lasts just as long as any other condiment in your fridge door. 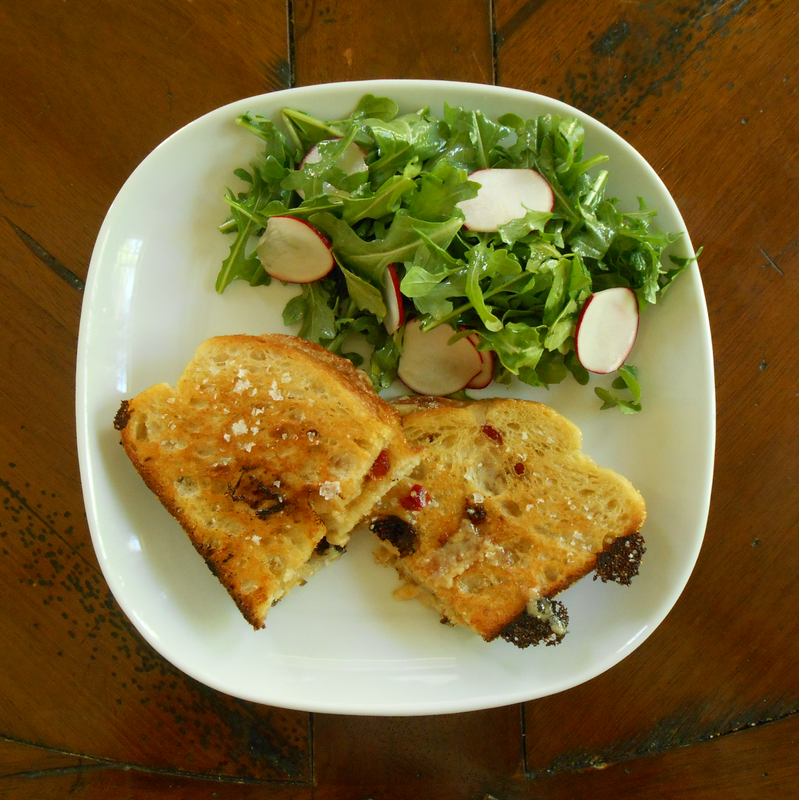 It provides the perfect piquant complement to the savory, rich cheddar and sweet caramelized onions. When the jelly and cheddar caramelize as they drip onto a hot skillet through the holes in the bread, you get one of the best grilled cheeses of your life. 1. Brush one side of each slice of bread with butter. 2. Toast bread butter-side down in skillet over medium-high heat until lightly browned, about 3 minutes. It helps to weigh the bread down with a plate or press it down with a spatula. 3. Spread 2 teaspoons pepper jelly on the toasted side of each slice of bread. Arrange cheese evenly on top of jelly on one slice of bread, and then top with the other slice of bread jelly-side down to form the sandwich. Brush the top of the sandwich with butter. 4. Heat remaining butter in skillet over medium low. Add sandwich butter-side up. Cover pan to help melt cheese. Cook until cheese is melted and the first side of the sandwich is golden brown, about 6 minutes. 5. Flip sandwich and continue cooking until the second side is golden brown, about 6 minutes. 6. Sprinkle lightly with Maldon salt and serve immediately with soup or salad, or just eat it right away standing up. We won't judge.